When members of far-right groups marched offline and into Charlottesville, Virginia, a year ago, many observers feared the emergence of a movement with momentum. 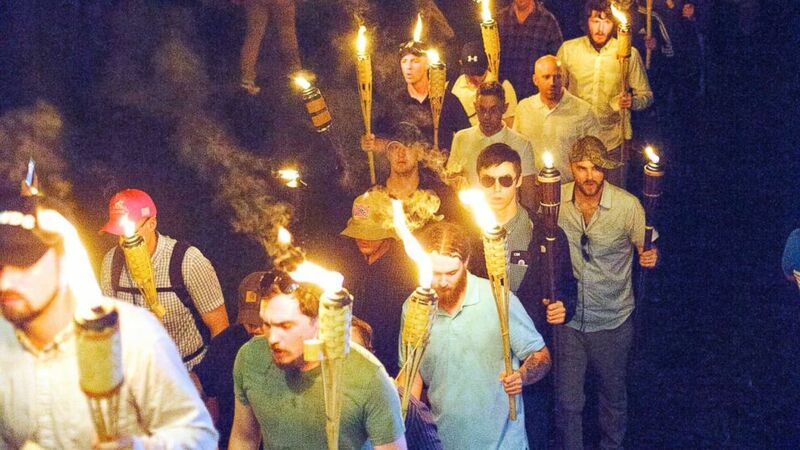 An ideology espoused on small far-right and white nationalist websites and message boards had somehow propelled hundreds of mostly young white men –- many of them wielding Tiki torches and chanting Nazi slogans — to storm one of the American South’s progressive enclaves, giving these fringe groups the attention its leaders had long craved. “Far-Right Groups Surge Into National View in Charlottesville” declared The New York Times of the now infamous Unite the Right rally, which left one person dead in a car attack and horrified the millions who watched videos capturing the violent clashes between far-right demonstrators and counter-protesters. But that spotlight brought scrutiny –- and a host of problems that have left some of those far-right groups more divided than ever. In the year since the rally, several prominent far-right groups have been plagued by infighting, censorship and legal battles; a few of the more prominent groups at last year’s rally have already crumbled completely. According to Keegan Hankes, a senior research analyst at the Southern Poverty Law Center, which monitors extremist groups throughout the United States, the far-right has lost some of its structure in the past year. After the violence in Charlottesville, Hankes told ABC News, far-right groups struggled to appeal to what he called the “alt-light,” groups and individuals who aren’t explicitly white nationalist but operate on the fringe of mainstream conservatism, sparking intense debate about how the groups comprising the movement should portray themselves. Milo Yiannopoulos speaks on campus at the University of Colorado in Boulder, Colo., Jan. 25, 2017. In 2016, former Breitbart editor Milo Yiannopoulos described the fringe, predominantly online extremist groups he referred to as the “alt-right,” of which Richard Spencer was a self-described figurehead, as a force. “Although initially small in number, the alt-right has a youthful energy and jarring, taboo-defying rhetoric that have boosted its membership and made it impossible to ignore,” Yiannopoulos said. Gavin McInnes, founder of the self-described “western chauvinist” organization the Proud Boys, has actively tried to disassociate the Proud Boys from white nationalist and alt-right views after the violence at last year’s Unite the Right rally, at which Proud Boys members were present. Jason Kessler, an organizer of Unite the Right rally, tries to speak while being shouted down by counter-protesters outside the Charlottesville City Hall on Aug. 13, 2017, in Charlottesville, Va.
As a result of the increased criticism, some groups have attempted to rebrand. The neo-Nazi group Vanguard America went seemingly dormant after the rally, but then its onetime leader, Thomas Rousseau, created the splinter organization Patriot Front, which now promotes carefully curated American ideals. Identity Evropa adopted a similar strategy, rebranding as a group engaged in a more conventional form of activism, such as posting flyers and banners, but in the service of defending white culture or promoting white civil rights. Some of these efforts could be a response to the crackdown that followed the rally, as the social media giants began removing prominent white nationalist figures and groups from their platforms. Twitter also updated its rules adding language that specifies, “You also may not affiliate with organizations that — whether by their own statements or activity both on and off the platform — use or promote violence against civilians to further their causes.” Vanguard America was removed from Twitter in December, arguably contributing to the group’s demise. The limited access to social media platforms has reduced the ability of individuals in the far-right movement to coordinate across the country in real time. “It caused a tremendous amount of fighting because people who previously could pretty easily raise resources and organize people in the spirit of propaganda lost access to a tool,” Hankes said. The online payment company PayPal banned several far-right individuals and groups from its platform following the rally amid reports that many of them had used the service to raise money. The scrutiny, Hankes said, has created an atmosphere of general paranoia in the movement. The Right Stuff (TRS) forum, a popular community on the white nationalist blog founded by Mike Enoch, for example, had previously been open to new users, but has since closed down access to new users and only vetted members are allowed to access it. Legal battles have also tainted the reputations of previously influential far-right and white nationalist leaders. Christopher Cantwell attends a white nationalist rally in Charlottesville, Va., Aug. 11, 2017. In July, Cantwell entered a plea agreement to two counts of assault and battery. Parrot and Heimbach that left Heimbach facing four charges — battery, intimidation, strangulation, and domestic battery committed in the presence of a child. According to court records, Heimbach has not yet entered a plea and his jury trial is scheduled for September, but the TWP, previously a major force in the movement, has dissolved in the wake of the conflict between its leaders. But perhaps the biggest threat to these groups comes from a handful of Charlottesville residents. In October 2017, 10 Charlottesville residents who, according to court documents, “each allegedly suffered some injury related to the rallies,” filed a lawsuit in federal district court accusing several individuals and groups of conspiring to carry out violence at the rally under the Ku Klux Klan Act of 1871, which was passed by Congress to prevent and penalize acts of racialized violence in the wake of the Civil War. White nationalist Richard Spencer, who popularized the term “alt-right” speaks during a press conference on Oct. 19, 2017, in Gainesville, Fla. The two dozen named defendants in the case include far-right figureheads such as Jason Kessler and Richard Spencer as well as prominent white nationalist organizations present at the rally, including the Traditionalist Worker Party and Vanguard America. Many of the defendants, including Kessler and Spencer, filed a motion to dismiss, arguing in part that the planning for the rally is protected by their right to free speech. In his motion to dismiss, Spencer stated that while he encouraged attendees to arm themselves, he specified they should legally do so. According to court documents, Kessler claims that the “Plaintiffs never explain specifically how Kessler personally did anything to them,” refuting the idea that he personally conspired or committed unlawful acts that caused injury. In July, U.S. District Judge Norman K. Moon of Virginia upheld the majority of the case, allowing the claims to proceed at a trial set for next summer. Despite the current disarray of far-right and white nationalist groups, John Cohen, the former acting undersecretary of Intelligence and Analysis at the Department of Homeland Security who is now an ABC News contributor, stressed that while the groups may be struggling, white nationalist beliefs remain pervasive. “The most disturbing part of this is that based on the political environment of this country, these political views and beliefs are becoming part of the mainstream political discourse,” Cohen said.